Real-time content monitoring is a mission-critical operation for broadcasters, telecom, and satellite operators. Traditionally, service providers have used monitoring systems based on specialized hardware with a dedicated, fixed interface designed to monitor a specific number of video feeds. Yet, bespoke hardware solutions require a substantial amount of manpower, have a higher cost of ownership than software, and are inflexible. Moreover, a hardware-based monitoring approach duplicates the infrastructure for service providers delivering both traditional broadcast and ABR streaming offerings, resulting in significant inefficiencies. This article discusses how a software-based approach can be used to consolidate service providers' monitoring operations, increasing operational efficiencies, flexibility, scalability, and cost savings. It will also highlight the challenges that service providers face with regards to monitoring traditional broadcast and ABR streaming services, outlining the key requirements they should look for in a software-based monitoring solution. A software-based, virtualized monitoring probe decouples the monitoring application from any underlining physical hardware, allowing service providers to exploit the increase in processing power and falling costs of IT server hardware. Hardware-based monitoring, on the other hand, runs dedicated applications with fixed bandwidth and network interfaces. If the probe were to break down, service providers would have to spend a significant amount of time and money ordering a replacement, setting up the new system, and dealing with other problems caused due to the downtime. One of the greatest advantages that service providers can gain with a software-based monitoring approach is dynamic scaling and resource pooling. Service providers no longer need to maintain two, separate monitoring workflows for their traditional broadcast and OTT channels. One software-based monitoring system, with a centralized management interface, can be used for both types of services. Resources are dynamically allocated and capacity is used efficiently. When a monitoring probe is running at its full capacity, it will command maximum resources, but when it's idle, the same resources can be used by other virtual applications. Using well-defined virtual machine templates, setting up a software-based monitoring probe for broadcast and ABR streaming services is fast and easy. The template takes care of the complete software environment required for running a monitoring probe including the operating system. For an operator, this reduces the installation time and simplifies the installation process. Scalability increases with software-based monitoring compared with hardware. In particular, service providers can deploy a farm of virtualized monitoring probes and scale their use as and when needed. For example, during normal times an operator may use fewer probes, however, during times of peak viewership and in order to ensure high quality broadcast, the operator can use all the monitoring probes. While this scaling occurs on the fly, dynamic resource pooling ensures that the physical machines are always optimally used either for monitoring or for other tasks. Software monitoring probes can be managed remotely, and service providers have total control over all monitoring-related functions for their broadcast and ABR streaming services, including real-time and historical monitoring information for video service debugging and analysis. Built-in support for high availability and fault tolerance ensure that the software monitoring probes will run 24x7 with zero downtime. The transition to a software-based virtualized infrastructure can present some challenges. Selecting the right hardware infrastructure to run different applications that are part of a workflow or certifying products from different vendors to work on an IT-approved virtual machine (VM) and operating system can be a time-consuming process. 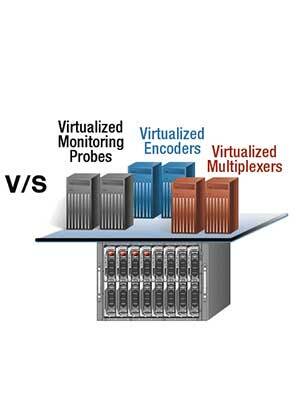 A real-time monitoring application performs many network I/O operations. In the case of virtual machines, all network traffic must pass through the physical network adapters, the virtual switch, and the virtual network adapters before it reaches the application running on the VM. When processing services with high packet rates, this additional layer of virtual devices can be considered a performance overhead. Real-time content monitoring solutions are network I/O intensive and latency sensitive; therefore, they need be tuned and configured to take care of overhead. If an existing hardware platform is used for virtualization, the monitoring software must have the right software plugins to communicate with the user interface software. Apart from this, software applications that are intended to run in a virtual environment must be rid of any dependency on custom hardware devices. These are not insurmountable issues, however, all of these factors must be carefully considered for virtualization to work as intended. Furthermore, current custom hardware-based monitoring solutions will have to be completely re-architected, and doing so may be a very difficult proposition. Given the massive advancements made in computer processing power over recent years, the broadcast industry is shifting from dedicated hardware-based solutions to software-based solutions running on readily available dedicated IT equipment. There is a general consensus among the players in this ecosystem that virtualization is the way to go. Physical and virtualization servers can be employed to achieve the benefits of flexibility and centralized monitoring. This requires a careful study of monitoring load, costs involved, physical infrastructure, and other factors. Therefore, it's important that operators consider which approach is the best fit for their organization. Interra Systems' ORION Content monitoring platform helps customers deliver error-free, high quality video. ORION helps service providers consolidate their monitoring operations to gain increased efficiencies while ensuring superior Quality of Service and Quality of Experience across all devices. With a software-based solution like ORION, service providers can perform all critical monitoring functions in a single, integrated platform. Its centralized monitoring and web-based architecture allows remote monitoring through any browser-enabled device, providing extreme flexibility and on-the-go decision-making.